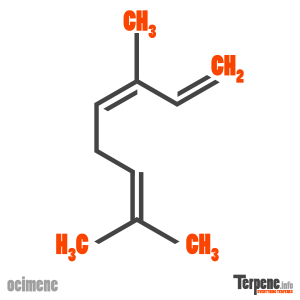 Ocimene is a monoterpene with a fruity, floral, some say wet cloth smell. Ocimene has exhibited anti-inflammatory effects in white blood cell through a variety of pathways. Antifungal effects are also seen with the human specific Candida species. And very interestingly ocimene showed specificity and effectiveness against SARS virus. The effects of ocimene on nitric oxide (NO) and prostaglandin E2 (PGE2) production in lipopolysaccharide (LPS)-activated RAW 264.7 macrophages was studied. The results indicate that the ocimene is an effective anti-inflammatory by acting as an inhibitor of LPS-induced NO and PGE2 production. Additionally, ocimene was shown to suppress the production of inflammatory cytokines including interleukin (IL)-1beta, tumor necrosis factor (TNF)-alpha, and IL-6. Chemical composition and anti-inflammation activity of essential oils from Citrus unshiu flower. Ocimene has been shown to be toxic to against Candida albicans. This effect was seen with Ferulago carduchorum essential oil. At 2340 ug/mL a minimum inhibitory concentration was reached. Biological Activities and Composition of Ferulago carduchorum Essential Oil. The essential oil of Laurus nobilis was evaluated on the SARS virus. Ocimene was noted to be a major constituent of the oil. The oil demonstrated a selectivity index of 4.16. Phytochemical analysis and in vitro antiviral activities of the essential oils of seven Lebanon species. Read through our forum on Ocimene below, or start your own topic. This forum contains 19 topics, and was last updated by enulu 10 hours, 48 minutes ago.